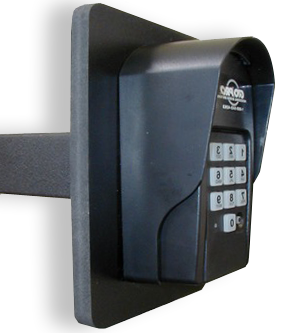 Discount Fence Supply, Inc. carries a variety of keypad entry systems. Whether it be a 1 code American Access Keypad to a 480 code Linear Keypad with push button entry capabilities we have it all. Need an inexpensive keypad? Look no further than the Advantage DKE series. The 26-100L features 500, four digit user codes, a fully programmable personal master code, latch code and night light. 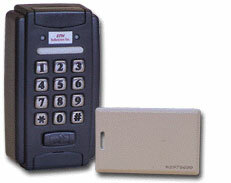 The AdvantageDK is the Most Popular line of digital keypads manufactured by American Access Systems. All models are available with 1,000 four digit user codes, latch code, sleep code, 3 strikes-your-out security, 2 relays and a external input. 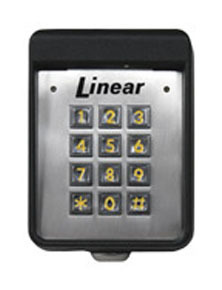 Linear's AccessKey digital keypad entry system is an excellent way to control access at a single entry point for facilities with up to 480 users. 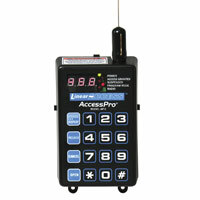 The Linear AKR-1 is a digital keypad entry system that includes a built-in radio receiver. It allows use of up to 480 block coded transmitters, in addition to 480 traditional keypad entry codes. Users can be assigned either type of code for system access. For sites that have a single entrance of gate, the AP-5 is the ideal wireless-based access control system. It can be used to remotely activate devices such as gate operators, door strikes, or door operators. The MDKP Wrieless keypad can transmit a unique signal for each 1-6 digit PIN code entered. It has a built in radion transmitter with a 250 foot range in line-of-sight conditions. Linear's AK-2 digital keypad entry system is an excellent way to control access at a single interior entry print for up to 480 users. The Digital Keypad can be easily installed as a wireless or wired keypad. It can be programmed to use up to twenty-five different personal identification number (PIN) codes. This gooseneck mounting plate for the GTO F310 is a one of its kind mounting plate. It enables the F3100/F310 to be mounted to a gooseneck stand. 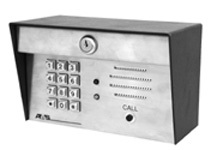 The 721H5 is a self-contained stand alone single entry proximity access control system.